After last week’s break from themes, Evan is back with multi-layered puzzle that is remarkably impressive. There’s a lot going on here… much of which I didn’t fully grok until after I had completed the puzzle. 79d. 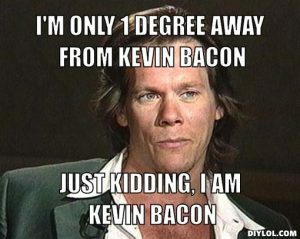 [Actor whose name is spelled out by the letters between six degrees in this puzzle] KEVIN BACON. Had I read the full clue here when solving, I probably would’ve A) had a faster solve time and B) appreciated the theme with a great “Aha!” moment during the solve. I don’t really know where to begin unpacking this puzzle. It’s so… tight. In a bunch of ways. Hoping I do it justice. Of course, the guiding concept is the Six Degrees of Kevin Bacon game. It’s possible that some older solvers may be unfamiliar with this PARLOR GAME, but it’s been a pop culture standard for more than 20 years now. In this case, each of the actors in the theme answers can be connected to Kevin Bacon by no more than one other actor, as outlined in the theme clues’ parentheses. Each of the actors’ names in the theme answers contains an abbreviation (circled letters) for an educational degree. In order they are DO, BS, MA, MS, MD, and BA. Again, I wish I had read the entire clue for 79 Down to appreciate this part mid-solve. I am only unfamiliar with DO as a degree which turns out to be for a Doctor of Osteopathic Medicine . The left-right symmetry came about because it was tough to find a group of six actors and actresses whose names a) contained the degrees with the letters of KEVIN BACON between them, b) could be placed in normal symmetrical order, and c) were all reasonably well-known. I probably didn’t fully succeed on that last one since I wouldn’t call Leslie Bevis a household name, and there may have been a different set where normal symmetry was possible. But that’s the set I found, so I tried to cross the names as fairly as I could. The title could not be more perfect as it’s both the title to an iconic movie, describes exactly what’s going on in the grid, and perfectly ties in to the Kevin Bacon game. Bonus theme material. Sure, it’s superfluous, but why not? 1d. [Mark, in “I, Claudius”?] COMMA. The “mark” in this case refers to the punctuation in the title. Great clue. 67a. [Apt name for a wrestler] NELSON. As in the wrestling hold. I love “Apt Name” clues. 100d. [Rapper ___ Jon] LIL. When in doubt with a rap moniker, LIL is a safe bet. 124a. [Apple jam product?] ITUNES. Great clue. 29a. [Freeing for a high price] RANSOMING. I’ve never ransomed before, but if I ever go ransoming in the future, I will demand a high price indeed. Often, when I don’t fully understand a theme until after I’ve solved a puzzle, I’m left feeling somewhat indifferent. That is definitely not the case here. This is admirable work. 24a. [Compliment to a lawmaker? ], OUTSTANDING BILLS! Terrific legislation, as opposed to bills that still need to be paid. 36a. [Compliment to a composer? ], RADICAL MOVEMENT! Not a political movement, but praise for the musical movement written by a composer. 62a. [Compliment to a lecturer? ], SWEET TALK! 64a. [Compliment to a taxonomist? ], STELLAR CLASSIFICATION! Uh, this one isn’t a familiar phrase to us non-astrophysicists. There’s some ugly fill crossing this 21 that’s sandwiched between the 9-letter themers. Too crowded! 67a. [Compliment to a champion speller? ], KILLER BEE! 87a. [Compliment to a charity organizer? ], SOLID FOUNDATION! 103a. [Compliment to a vegetable gardener? ], SMASHING PUMPKINS! “Smashing” has a decidedly British vibe to it. Cute theme, except for the middle one. 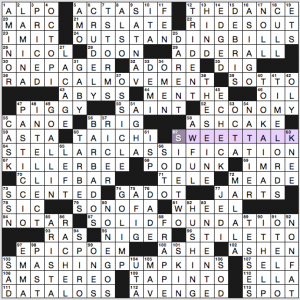 I was bugged by some awkward phrasal answers while I solved. To wit: ACT AS IF, THE SEINE (needless inclusion of THE), NO TAR, TOOK AIM AT (less bad than the others), and SO TO clued as 66d. [Words said before bed? ], to trick solvers into filling in GO TO, but then disappointing us when we realize “SO TO bed” is more or less being presented as a unit of meaning. The phrase is “And so to bed,” gotta have that and. (Just clue it as a fill-in-the-blank if you don’t want to use MLB player Geovany Soto, Congresswoman Cynthia Soto, or actress Talisa Soto.) DAREN’T also feels phrasal and awkward. Did not know: 80d. [Worlds external to the mind], NON-EGOS, and 47d. [Musical medley], PASTICCIO, and also 60d. [French city where D’Artagnan lived in “The Three Musketeers”], TARBES. I’ll bet the CLIF BAR/TARBES crossing, or “SON OF A…” crossing that and NON-EGOS and partial A FIG, posed trouble for plenty of solvers. And CLIF BAR/PASTICCIO. Highlights in the fill: ADDERALL, a ONE-PAGER paper, CLIF BAR, JARTS, BARBADOS, T-STORMS, TIME LORDS, and GO LIMP. I was late to blogging tonight because (1) we went out to dinner at Lou Malnati’s, home of a unique sort of deep-dish pizza, (2) it took me two hours to walk home from dinner, and (3) I detoured over to Wrigley Field and caught the final Journey song, “Don’t Stop Believin’.” (They’re touring with Def Leppard and switch off with which band headlines. Tonight was a Def Leppard headlining night, which is good because if Journey had just started at 8:30, I might have stayed for an hour or two and this post would be even later. Here’s a decade-old live performance of the same song, featuring the current lead singer, Arnel Pineda. He’s the Filipino guy who the band found via his YouTube cover songs, and he sounded so much like Steve Perry, he joined Journey. 3.75 stars for the puzzle, 4.75 stars for “Don’t Stop Believin'” live. An ay sound is added to phrases to make new, wackier phrases. [50a: Money for the weekend? ]: FRIDAY DOUGH. Fried dough. Mmmm, fried dough! Get it at the county fair, or even make it at home. [90a: Emotionally affect Taiwan’s capital? ]: TOUCH TAIPEI. Touch type. Do they still teach typing? [107a: Just fine sofas? ]: OKAY FURNITURE. Oak furniture. This one felt the most roll-your-own; could put any type of wood before furniture and you’ve gotta phrase. [122a: “Here’s some energy harnessed by eels”? ]: MORAY POWER TO YOU. More power to you. My favorite of the set; eels are inherently hilarious. One of my comedy-writing friends in college used to do a spot-on impression of Ted Knight narrating the Hanna-Barbera Super Friends show from the early 1980s: “Using his telepathic powers, Aquaman summons a school of moray eels!” It slayed me, every time — enough so that at inopportune moments (like a History class lecture, or many years later, the wedding ceremony of a mutual friend), he would just whisper “moray eels” and I’d laugh uncontrollably. 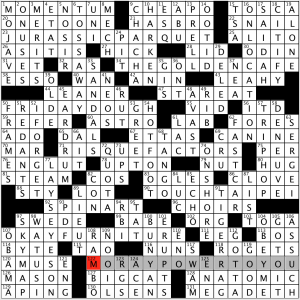 For your consideration today, we have an add-a-letter-theme: each theme answer has a “W” added to a common phrase. Wackiness results. 3d [Dessert for a large legal firm?] is TRIPLE LAWYER CAKE (triple layer cake). Do three lawyers constitute a large firm? Or is there more than one cake? Mmm. Cake. 24a [Unsteady walk while using social media?] is TWEETER TOTTER (teeter totter). We’ve all seen this in action. 38a [Lowly short-order cook?] is a FRYING PAWN. Not to be confused with a fried prawn. 58a [Bawdier Bavarian britches?] are LEWDER HOSEN (lederhosen). This is my favorite entry in the puzzle, partly because I mis-read the clue the first time and was expecting a, well, different answer. Hey, it’s easy to miss the “r” in one of those words. 79a [Beefcake’s breakfast] would be BRAW FLAKES (bran flakes). I’m picturing the Brawny Paper Towel lumberjack on a Cornflakes box, and if I had better Photoshop skills, you’d see it, too. 98a [Return from a salamander farm?] is NEWT PROFIT (net profit). Wasn’t he Speaker of the House in the 1990s? 116a [Drawback of the best place to watch the fight?] is RINGSIDE SWEAT (ringside seat). Ick. 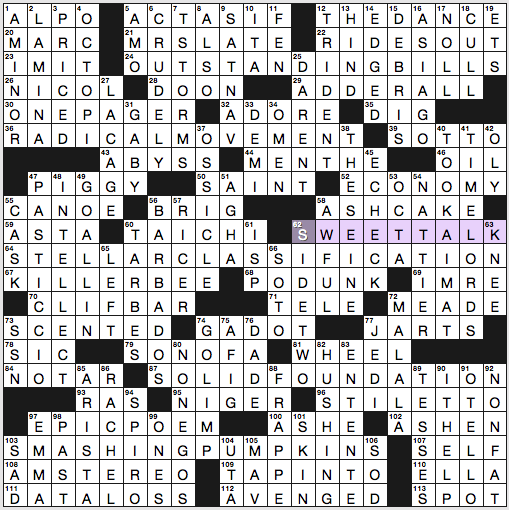 I like the variation in length of the theme answers, and I like their location in the grid – both across and down. I also appreciate the humor of the theme answers. I often find Sunday-sized puzzles to be a slog. This one was fun. It is a lot of theme material, and the fill suffers somewhat as a result. ASHAKE? No. [Scot’s nots] in the clues not far away from SCOTCH as an answer? Nae. The suffix –ATOR? Nope. This didn’t ruin the puzzle for me because I really did enjoy the theme. 9d [Enola Gay manufacturer] is BOEING. I wonder if they have that photo up in the corporate offices. 19d [Searches carefully] is SCOURS. I had SCOUTS at first. I filled in 30d from crossings and raised my eyebrows at STD*. I needn’t have. The clue is [Like A/C in most cars]. I wonder if this is true outside the US. 52a [Nasty storm] is NOREASTER. 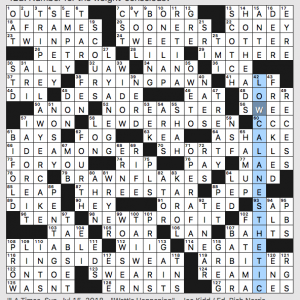 I usually see it written as NOR’EASTER, abbreviated from “northeaster.” There’s no abbreviation signal in the clue, which surprised me. 107d [Picture book pachyderm] is BABAR. I loved those books when I was a kid, and my mother saved my copies. I happily brought them home to read to Emma – and was horrified at the racism, colonialism, and just plain creepiness. The Old Lady takes Babar home with her and buys him nice clothes and a sports car? That’s not right. I never did read them to Emma. What I didn’t know before I did this puzzle: that Ben Nevis was a brand of SCOTCH as well as a mountain. This entry was posted in Daily Puzzles and tagged Brendan Emmett Quigley, Byron Walden, Evan Birnholz, Joe Kidd, Sam Ezersky. Bookmark the permalink. I enjoyed SWEET TALK, KILLER BEE and especially SMASHING PUMPKINS. The rest of the NYT themers fell kind of flat for me. I agree with Amy that STELLAR CLASSIFICATION, though it seems reasonable, isn’t very much in the language. Also, OUTSTANDING debt or OUTSTANDING balance (compliment for an acrobat?) seem much more familiar than OUTSTANDING BILLS. Had not run into PASTICCIO as a musical term. I have seen it as the Italian version of Greek pastitsio, which is quite tasty. I’ll bet a lot of younger solvers have never heard of JARTS, but the crosses seem pretty fair. DNF on the NYT. Ugh. What’s irritating is that I got the CLIFBAR/TARBES intersection (which seemed rather unfair to me)– but missed a PRIMED/PRICED problem that I probably should have spotted. NYT was demonstrably poor. ASHCAKE is bad enough, but to leave it hovering over ASHEN & ASHE—which are side-by-side—is just indefensible. Also bringing in SMASHING PUMPKINS, which is a band name, not a phrase, as the final themer seems ridiculous, especially for a puzzle that’s overrun by its theme anyway. The last two Sundays have been bad & it seems like they’re hoping that it’s summer & we’re all too drunk or hungover to notice or care. It’s disrespectful to the solver. Hear, hear!! The puzzle is not supposed to be reliant on googling for names of people most of us never heard of or whose movies/TV shows/podcasts we haven’t seen/heard. Maybe the editor needs to take a summer break. Agree with both of your comments. A very bad puzzle full of naticks. Exactly. There seemed to be an excessive reliance on names in the fill. I hate having to resort to Google. And my filling in BERG for BRIG made it a slog for awhile. However, STELLAR CLASSIFICATION came easily, go figure! 58-D wouldn’t be a completely inapt description for this puzzle considering its theme is uninspired and a good portion of it felt like a round of Jeopardy! There’s a digital humanities project at Carnegie Mellon University that visualizes the social, political, and scientific networks of Elizabethan England. It’s called Six Degrees of Francis Bacon. 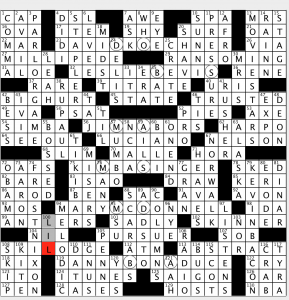 I don’t think I’ve ever commented on puzzle ratings, which I consider imperfect at best, but I’m interested in the lower ratings for the WaPo puzzle. I didn’t know all of the actors but they easily fell from the crossings. Much like Jim, I didn’t fully appreciate the puzzle until I finished. But when I did it was “Wow!”. It’s ok if someone rated it lower than I did – mileage does in fact vary – but I’d like to know what it was that warranted a sub-par evaluation. I appreciate the compliments, but I’ve long stopped worrying about the ratings and (for many reasons) I don’t find them to be very meaningful. Thanks for the review, Jim. The NYT had a lot of strange fill for me, too. I have worked in astronomy and still found STELLAR CLASSIFICATION a bit weak, but it was more the CLIF BAR / TARBES sort of thing that got to me.